The following guest post was voted best in the class for an undergraduate assignment on fish adaptation from Humboldt State University’s Fall 2018 Fish Conservation and Management course taught by Dr. Andre Buchheister. 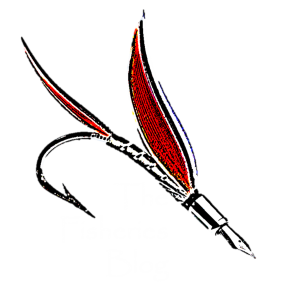 The assignment required students to find a peer-reviewed article on a fascinating fish adaptation or species and to communicate the scientific information in a blog format to a general audience. With its clear head and large green eyes, the Barreleye (Macropinna microstoma) looks like an alien with a glass bulb on its head out of a sci-fi film. At first glance, it would seem as if the fish’s eyes are black dots near its mouth, but in fact, they are located further above within its translucent head. The large green “barrel” shaped eyes spend most of the time looking up vertically for prey through the top of the Barreleye’s protective clear head, until it finds that prey and the eyes move horizontally as it targets its next meal. Not much is known about this mysterious, fascinating species that lives in the North Pacific. Until the 1990s, no one had even observed this strange fish in its natural habitat, or even alive for that matter. Scientists first captured video of this specimen in 1993 with a remotely operated vehicle (Robison 1993). Most recently in Monterey Bay, a Barreleye was brought up to the surface in a small mid-water trawl net (see this video of Monterey Bay Aquarium Research Institute attempting to capture the Barreleye from a remote operated vehicle). This fish stayed alive for several hours in a shipboard aquarium, where most of our current knowledge of the species was recorded. Due to the small sample size of specimens, it is very hard to accurately judge such things as age, sexual maturity, and mating habits of these fish. Of the five fish recorded, sizes ranged from 50 to 150mm standard length, and all fish were observed or captured in the mesopelagic depths of the ocean nearly eight football fields deep where light can only penetrate in the lowest amounts. Screenshot of a video taken at a depth of 744 m, showing the clear head and large green eyes of the Barreleye (Macropinna microstoma; Robison 2008). So, why might a fish have such an interesting adaptation as a completely translucent head you ask? Nature answers that question in the way that it usually does: for survival, of course! The Barreleye is suspected to predominately eat small zooplankton because of their elongated intestines and multiple caeca (lateral dilations of the gut), which are common in species specialized to digest these kinds of plankton (Robison 1984). The main source of these zooplankton is on the tentacles of siphonophores, gelatinous creatures similar to jellyfish. As we all know, a sting from a jellyfish can be quite painful. In order to protect itself from these harmful stings, the Barreleye has developed a translucent housing for its enormous green eyes. This housing allows the fish to clearly see its prey while protecting itself from the painful stings of the siphonophores. If the fish did not have this translucent adaptation, its feeding would be synonymous to us trying to eat honey from a beehive without getting stung. Beyond the translucent head, the Barreleye’s eyes, themselves, are also unusual. They are extremely large, green in color, and look straight up at a 90 degree angle from the mouth. Since this fish lives at such extreme depths (1800-2400 feet), most of its prey lives above it. The bright green pigment of the eyes allows the fish to spot the bioluminescent colors of the creatures that play host to its prey in extremely low light situations. Almost like night vision, these green eyes require only a trace amount of light to be able to see very long distances. Side view of the Barreleye (Macropinna microstoma), in a shipboard laboratory aquarium. Figure (A) shows the eye position of the fish when at rest, figure (B) demonstrates the movement of the eyes more horizontally (Robison 2000). With eyes facing 90 degrees from its mouth, you may be thinking this must make it pretty hard to eat, but the Barreleye has that covered as well. In the most recent observations (Robison 2000), scientists have discovered that when this fish swims vertically in the water column towards its prey, a muscle in the eye is able to shift the eyes 90 degrees from looking directly up to straight forward where its terminal mouth is located. This allows the fish to accurately attack and consume its prey with great precision. Further research is needed to better understand the Barreleye and its ecology, but in just a very short time we have already made large advancements in our knowledge of this creature. I personally was drawn to the strange appearance of this fish but was quickly intrigued by how little we understand about it. The Barreleye is a perfect example of the vastness of the ocean and how little we actually know. In the future, I hope that we are able to learn potentially how old this species is and if there are other species with similar (or even stranger!) adaptations for living at such great depths. Hello, my name is Justin Miller and I am an undergraduate in the Fisheries program at Humboldt State University (HSU). I grew up in the Central Valley of California where I was exposed to fishing at a very young age. One of my earliest memories in life is fishing for trout in the Sierra Nevadas. Growing up in the valley, I had a great opportunity to experience some of the best lakes, rivers, and the delta, which lead to my deep passion for fish. It was not until later in life when my grandparents moved to the Mendocino coast that I was introduced to marine fisheries. After working as a deckhand on a local charter boat over the summer in high school, I was hooked. The vastness and variety of the ocean completely blew my mind and hatched the idea of an education in fisheries. I am extremely thankful to be able to participate in this one of a kind program at HSU and overjoyed that I can create a career for myself in a field about which I feel so passionately. Robison, B. H. 1984. Herbivory by the myctophid fish Ceratoscopelus warmingii. Marine Biology 84:119–123. Robison, B. H. 1993. Midwater research methods with MBARI’s ROV. Marine Technology Society Journal 26:32–39. Robison, B. H. 2000. The coevolution of undersea vehicles and deep-sea research. Marine Technology Society Journal 33:65–73. Robison, Bruce H., and Kim R. Reisenbichler. “Macropinna Microstoma and the Paradox of Its Tubular Eyes.” Copeia, vol. 2008, no. 4, 18 Feb. 2008, pp. 780–784., doi:10.1643/cg-07-082. “Researchers Solve Mystery of Deep-Sea Fish with Tubular Eyes and Transparent Head.” MBARI, 10 July 2017, http://www.mbari.org/barreleye-fish-with-tubular-eyes-and-transparent-head/.